Car theft is exactly what we carry insurance for, right? Sure, it may be a hassle, but insurance will pay to repair that broken lock, and they’ll give you a payout to replace what was stolen—as long as you meet certain criteria. Anyone who has experienced car theft before has probably experienced the frustration of their insurance policy only covering part of what was taken, and only after a police report was filed, the theft was investigated, and a lot of time passed. When it comes down to it, we have insurance for accidents and emergencies, but it’s much better to simply avoid those circumstances in the first place. At Rocket Locksmith, we understand just how far prevention will take you. 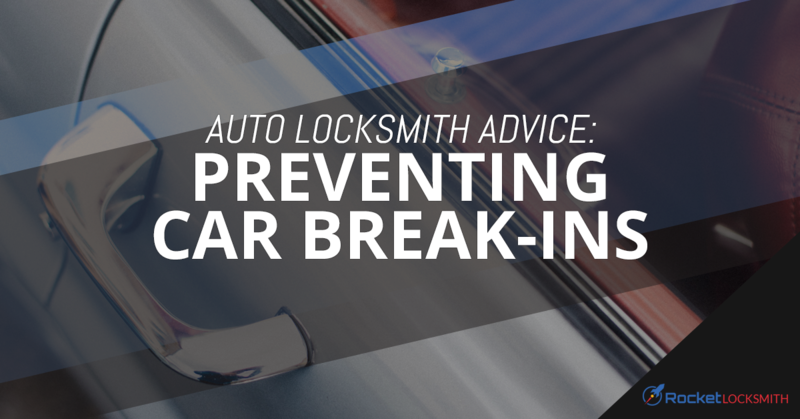 In order to protect your vehicle and belongings, and avoid calling an auto locksmith for help, try these tips to reduce your risk of break-ins. First and foremost, one of the easiest ways to deter car break-ins is to make it appear that you have nothing worth taking. Unlike your home, where you can close curtains, your car offers great visibility on the road—and just as clear a view into your car. Make your vehicle less of a target by hiding or taking your valuables with you as much as possible. For example, if you have a book of CDs you keep in the car, tuck them into the glove box or under the seat. And of course, don’t leave those designer sunglasses lying on the passenger seat in full view. Stick them in that handy pocket that exists on basically every driver’s side door, where they’ll be neatly hidden. If you have a string of errands to run, it’s understandable that you don’t want to carry those heavy bags all day. However, it’s important to be cognizant of your surroundings when you go to stow things in your car. If you’re moving locations, be sure you stow everything straight in the trunk before you leave, rather than upon arrival at your next destination. If you drive an SUV with a visible trunk space, get in the habit of keeping an awning drawn across the trunk space so it looks empty. If you have an aftermarket sound system in your vehicle, this can be a sign to thieves that you’ve put money into your vehicle in other ways, as well. There’s no need to advertise this to opportunistic thieves. Most of those aftermarket music players come with a detachable faceplate—and won’t work without it—so get into the habit of taking the faceplate with you each time you exit the car. This advice goes for your home as well as your car: get visible protection. In a survey, convicted burglars discussing their methods admitted that their targets were, more often than not, opportunity rather than planned targets. Further, they admitted that an alarm system was generally a good enough deterrent to send them to a different target. When it comes to protecting your vehicle, a blinking red light or signs that point to an alarm system often work as a good tool to deter thieves. One of the things you can most easily control is where you park. If a thief will be easily visible on the street, your car is less likely to be a target. In order to protect your vehicle from theft, choose parking without any easy hiding points. Don’t let your vehicle be a target. Get your broken locks fixed and other auto locksmith services from your local team. Contact Rocket Locksmith today for experienced car, home, and commercial locksmith services in St. Louis!